This wrist monitor is smaller, lighter and more compact than other wrist monitors and is ideal for travel. The automatic memory keeps your last 90 blood pressure measurements for effective tracking. 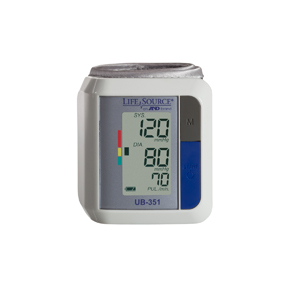 Unlike other monitors that measure blood pressure during deflation of the cuff, the UB-351 wrist monitor measures blood pressure during cuff inflation for a faster, more comfortable reading. Calculates and displays average readings.